With the holidays fast approaching, you might want to reward your employees for all their hard work in 2018. Gift-giving ideas include gift cards, holiday turkeys and achievement awards. Although your intent may be essentially the same in all these situations, the tax outcome for recipients of your goodwill may be quite different. Typically, it depends on the value and type of gift or award. The Tax Cuts and Jobs Act (TCJA) clarifies the tax treatment of certain achievement awards of property. This provision applies to amounts paid or incurred after 2017, including gifts made during this holiday season. If you give a gift to a member of a customer’s family, the gift is generally considered an indirect gift to the customer. However, this rule doesn’t apply if you have a bona fide, independent business relationship with the family member and the gift isn’t intended for the customer’s eventual use. If you and your spouse both give gifts to a customer, the two of you are treated as a single taxpayer. Thus, your combined limit is $25 per recipient. It doesn’t matter if you have separate businesses, are separately employed or whether you each have an independent connection to the customer. Similarly, if a partnership gives a gift to a customer, the partnership and its partners are treated as one taxpayer. Finally, there’s some leeway on the $25 limit. Incidental expenses — such as engraving, packaging, insurance and shipping costs — don’t count towards the cost of a gift. Make this a happy holiday season from both a gift-giving and tax viewpoint. Stay within the boundaries discussed above to maximize the benefits for employees and employers. 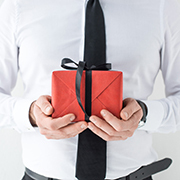 If you have questions about the business gift-giving rules, contact your tax advisor.